Stochastic Ising models can be thought of loosely as reversible spin systems with strictly positive rates. (For a more precise version of this statement, see Theorem 2.13.) The measures with respect to which they are reversible are the Gibbs states of classical statistical mechanics. Thus stochastic Ising models can be viewed as models for nonequilibrium statistical mechanics. These were among the first spin systems to be studied, because of their close connections with physics. 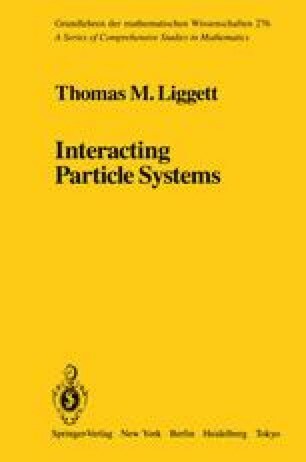 While no prior knowledge of statistical mechanics will be assumed in this chapter, the reader may find it useful to refer occasionally to more comprehensive treatments of that subject. Recommended for this purpose are Ruelle (1969, 1978), Griffiths (1972), Preston (1974b), Sinai (1982), and Simon (1985).